Whether you’re planning a special event or big birthday party bash, the audio set-up you at your event is an important consideration. From setting an atmosphere and vibe to ensuring your key messages are communicated, or perhaps entertainment is the main focus or highlight, i.e. a live band, dance floor or DJ – the audio hire that you choose will influence all of this. 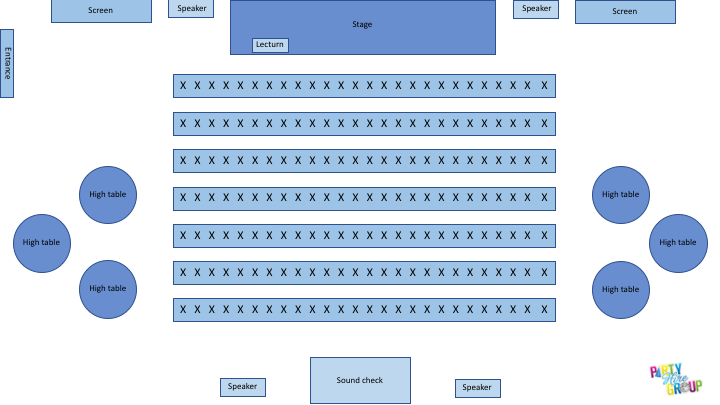 Having a clear visualisation of your floor plan is a good place to start when planning the audio set-up of your event. Once you have this, you should identify the main areas where people will be congregating or gathering such as the bar service area, food service, dining or seating, bathrooms and the dance floor. If your event party has a dance-floor, this is the most obvious place to have your audio system set-up. See example floor plan below. It’s positioned somewhere close to the centre and able to project across the room. If you are planning a corporate or conference event, your floor plan is probably more likely to look something similar to the below. For a corporate event, it’s more common that the speaker and sound audio system will be positioned where the sound is best to project evenly across the room. Usually this is at the front or back of where the audience is facing. Having the audio sound system set up at the front of the room can also be a good visual cue to guests of where the main event is or audience focus should be. The layout of the tables and chairs is also a key influencer of this. You can read more about setting up corporate event spaces on our blog post here, or check out our range of affordable bar table and chair hire here. If you have guest speakers presenting, a lectern is useful to provide a comfortable place for them to keep notes (if required), and minimise too much walking around on stage which can be distracting for the audience. View lectern hire here. If you have a panel, high chairs are a great for on-stage seating as it looks modern and informal, but still is able to create organisation so the audience knows where to look, who is speaking and brings the event together. Seriously consider the run sheet of the event and how you want guests to engage throughout the day. For example, a focus on the key note speakers may be the most consideration for the earlier part of the day, however providing a comfortable and inviting space to mingle and network afterwards may be equally important for the latter half. Last but not least, make sure you include the time you’ll need to bump in and bump out your audio hire, and factor this into the sound check times on your run sheet. It’s always important to do a sound check on all audio hire when you set up your event to ensure all cords are correctly plugged in, the volume is at the right level and that the frequency is balanced. Check out our range of audio hire here for the best, cheapest and most affordable audio hire in Sydney.